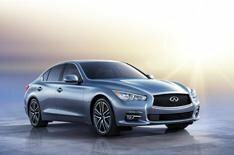 Infiniti Q50 appears at Detroit show | What Car? The Infiniti Q50 saloon has been revealed at the Detroit motor show, ahead of its arrival in the UK later in the summer. This new Infiniti is the first to feature the companys new naming policy, and the Q50 is the replacement for the outgoing G Series saloon. All of Infinitis models will now start with either Q or QX. Saloons, coupes and convertibles start with a Q, while crossovers and SUVs take the QX prefix. The styling on the Q50 is also a hint at Infinitis future, with a company spokesman confirming that the new cars look will spread across the model range. Features such as the 'double arch' grille, the arched roofline and the crescent-shaped C pillars are all likely to feature on replacements for models such as the EX, FX and M Series models. Two engines have been confirmed for the Q50; a 3.7-litre V6 petrol and a 3.5-litre hybrid. These engines are likely to feature in the European line-up, but the core offering for the cars on sale in the UK will be four-cylinder petrol and diesel units from Daimler. It is also expected that the European Infiniti Q50 will come with a rear-wheel- and all-wheel-drive option, and with a seven-speed automatic gearbox. It comes with 17-inch alloys as standard, but a set of 19-inch wheels can be specified, along with run-flat all-season, or summer tyres. The Q50 comes with a new adaptive steering system, which Infiniti claims is more responsive than a mechanical system. It also gets an enhanced lane-keep assist system, which claims to be able to make minor adjustments to the steering when the car is knocked off course by crosswinds or poor road surfaces. Inside, the Q50 gets new seats, and more foot and legroom than the old G Series car. The boot space in the petrol model is now 510 litres, up from 450 in the outgoing model. The infotainment system offers two touch-screens that are said to be able to recognise hand gestures to make controlling them easier. The upper screen controls the most frequently used applications, such as the map, and the lower screen contains everything else. Some critical controls, such as the heating, are still controlled by manual switches. The European Q50 will be revealed at the Geneva motor show in March, and more details on pricing, engines and equipment will be announced closer to the show. It will go on sale in the UK around September 2013.